Kashmir or Cashmere to some has been described as “Firdous Ba Roye Zamin Ast…:” “Heaven on earth …”. This phrase was for the natural beauty of the region. It also befits the handicrafts of this place. This site is dedicated to bringing the best of Kashmir in carpets, shawls, silks, etc to our esteem clients. Not certain when the making of the first pile carpets was starts in Kashmir, but credit goes to king Zan-ul-Abidin ( better known as ‘Budshah’ – the great king) of 15th century. 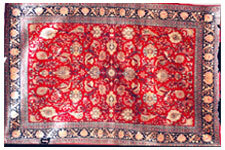 ‘Budshah’ brought carpet artisting from Persia to Kashmir to train local inhabitants- Budshah also introduced carpet wearing factories (Karkhanas). Thus the trade started to flourish. Later, the Mughal emperors Jehangir and Shah-e-Jehan (who built famous Taj Mahal) gave a boost to this industry. Maharaja Ranbir Singh, in mid 18th century also provided an impetus to the carpet industry both in quantity and quality. During this region, an exhibition was organized at Capital Palace- London. It was a great success. Western world realized the beauty and appreciated the artistic work of local artisians. Many European Companies established factories in the Kashmir Valley (Micheil & Co., Eash india Co., C & M Hadow, etc. to name a few). After many ups and downs, the carpet industry is now a well organized and established facet of life in Kashmir Valley. Thousands of people are associated with it. 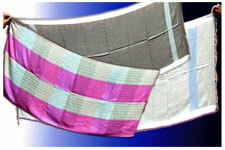 The products are unique and no two designs are similar in character. The industry has been basically a handloom based one with traditional graphics and designing. But now many modern patterns and designs are also available. The traditional designs are replicas of ceilings of old monuments, palaces, panitings, photographs, rugs and depiction of sufism. The designs are created in traditional notation language called – ‘Taleem’. This is a complete design of a carpet including knots per square inch, colour scheme, pattern, weft lines and speed of weaving. These designs are memorized by master craftsmen who chant these in a sing–song way. Thus creating an ambiance for carpet weaving with very local flavor. A lot of mathematics goes into the design of this ‘Taleem’. A software is also being locally developed for ‘Taleem’ by a local firm.